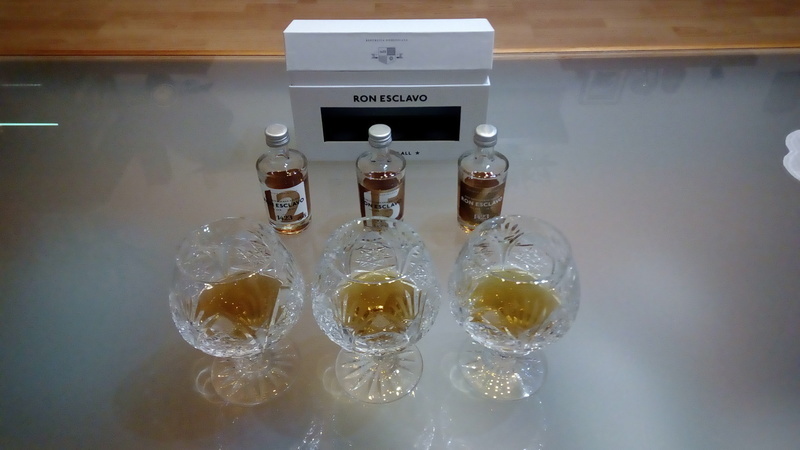 Have you found an online vendor selling Ron Esclavo XO? Schönes dunkles Bernstein im Glas, wie Waldhonig. In der Nase, wie in heisses Karamell getauchte dunkel geröstete Hölzer mit Pflaumen und Zimt garniert. Im Gaumen, ganz weich, süss und rund, ein wenig Solera typisch, dennoch sehr interessant. Die Zunge wird vom Holz und Karamell umschmeichelt. Aromen von Toffee, dunkle Schokolade, dunkles Steinobst und dunkle Gewürze gesellen sich harmonisch dazu. Im Abgang, klebriges Karamell am Holz, das mich schon seit Anfang begleitet. Lecker und langanhaltend. Beautiful dark amber in glass, like forest honey. In the nose, as in hot caramel dipped dark roasted wood with prunes and cinnamon garnished. The palate, very soft, sweet and round, a little Solera typical, yet very interesting. The tongue is caressed by the wood and caramel. Aromas of toffee, dark chocolate, dark stone fruit and dark spices join in harmoniously. In the finish, sticky caramel on the wood, which accompanied me since the beginning. Tasty and long lasting. Beautiful simple bottle. Lovely dark color. First smell from the bottle - Very sweet vanilla, sugar, caramel, grapes and prunes. In the glass - Lovely dark color and wonderful legs. Looks very rich, similar to Zarcapa XO. Nose - Molases, malt, conac, vanilla, coffee and caramel. Taste - Sweet and woody. Lots of oak. Sugar cane, caramel coffee and chocolate. Nice long creamy finish with a hint of coconut. Fills out the mouth really nicely. A very nice rum! From the top of the shelf and quite affordable. Lovely nuances in both taste and nose. Defiantly a keeper, and a “re-buyer” for me. I found this to be a great rum. One of the best values there is (after the Ron Centenario 20 which is cheaper and even better imho). Super easy drinking and smooth for 42% abv. Smells and tastes of molasses, toffee, caramel, burned sugar, honey, cinnamon, spice, and just a hint of orange. A fabulous rum that is a VERY high 9! Så god, men straight from the cask er bare så meget bedre. Prøv den også. Best of Esclavos, smoothest, deep color. But e.g. Opthimus 21 from same company is tastier. For me one of the best rums I have ever tasted. Very smooth sipping run, beautiful nose and balanced honey taste. Plus the beautiful reddish color in a great bottle, 10 from me. On the nose you get sweet aromas of vanilla and fruit. When the rum have been breathing for a while in the glass the aromas gets even smoother. In mouth you get smooth flavours of vanilla and caramel. You can also taste a bit of oak and spice. This rum is very sweet, in a good way. The aftertaste is very smooth with a little bit of oak and spice. I nice rum but maybe a little bit of too much oak for my taste. Nice dark color with coffee, butterscotch, toffee and caramel flavor. The alcohol is present at the first nose and disappear gradually. There is some notes of chocolate, cocoa and nuts. This rum is round, warm with a medium finish. This rum is fantastic for this price. Great aftertaste. Full body aroma in my nose. Smart choice. Máme tu další rum z Dominikánské republiky, tentokrát Esclavo XO, který zraje systémem solera až 23 let. Což znamená, že 23 let má jen ta nejstarší složka ve směsi. Čeští vychytralí, v lepším případě pouze špatně informovaní prodejci se vám budou snažit nakukat, že jde o rum třiadvacetiletý, samozřejmě jim to nevěřte. Viz třeba dobrůtka.eu, nebo slepě kopírující heuréka, případně další obchody, které kopírují lživé a zkreslené informace od jiných. Shrnutí:	Výtečně vyladěný rum, pochutnal jsem si. Měl jsem 50 ml miniaturu. So smooth and round with lots of sweet carmeltaste. You'd never guess it's 42% when tasting. helt klart den bedste af esclavo flaskerne. har noget mere at byde på end de to andre flasker. Ron Esclavo XO Rum blander sig mellem de bedste fra Den Dominikanske Republik. Smuk farve og tilpas sødme. Havde hørt meget godt om denne Rom. Så jeg glædede mig meget til at smage den. Først gang blev jeg skuffet! Men anden gang, Vav, det var straks bedre. Lækker duft, sød på den gode måde, og en rigtig god eftersmag. One of last years absolute stunners! In that price range it is some of the best I have ever tasted. Sweet, silk-soft and so well balanced.! Fat body and a nice warmth to it! Considering the price, this is some really good stuff. It's characteristics and quality is pretty close to another great dominican rum, the Quorhum 30 Aniversario. The nose is full with notes of caramel, coffee and chocolate. The palette is big bodied with ripe notes of sweet brown sugar, coffee, leather, wood and spicy tingles in a nicely rounded package. The afterburn is a sweet, long and creamy, warming sensation. To me the slightly more expensive Quorhum 30 still comes out on top though, with better complexity. kenne diesen rum aus dem adventskalender 1423. und war mein absoluter favorit! preis leistung stimmt für mich 80.- sfr. pro flasche. Zatial co 12 a 15 rocna verzia Esclavo ma prilis nezaujali, XO je uz chutou niekde uplne inde. Z tychto troch variant je najsladsi a chutovo najkomplexnejsi. Vonia po karamele, vanilke, trosku citit drevo. Stale si ale myslim, ze v cene okolo 60€ su lepsie a chutnejsie volby - Centenario 20y alebo napr. Santos Dumont XO. Pro mě perfektní jak ve vůni, tak v chuti. Příjemně sladký, ale ne moc.